This is the site of the LEO Computers Society celebrating the World's first business computer. The LEO Computers Society aims to increase public knowledge and understanding of the early days of business computing - the basis for the transformation we all now take for granted. The Society also acts as a focal point for those who worked on LEO computers and encourages two-way communication - gathering reminiscences for our archive and giving opportunities to meet. It is not sufficiently widely appreciated that it was a British catering firm, J. Lyons and Co - famous for their teashops, Swiss rolls and ice cream and with a prescient interest in new office management techniques- which pioneered the development of computing for commercial applications. As the Guinness Book of Records ratifies - Lyons Electronic Office (LEO) was the first business computer in the world. the world's first regular routine office computer job. 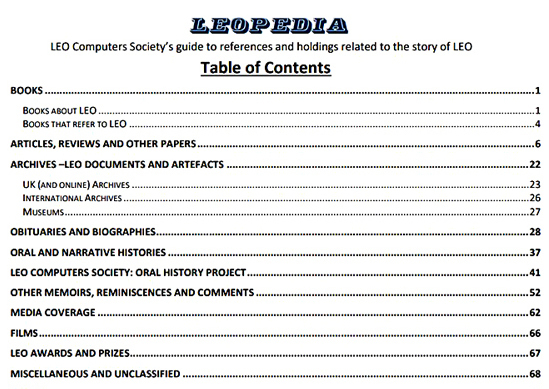 The LEO Computers Society's mission is to ensure that the heritage of LEO is preserved, protected and promoted. The importance of LEO has been recognised by displays in many prestigious institutions such as the Science Museum, London, the National Museum of Computing at Bletchley Park, the Centre for Computing History, Cambridge and as far away as Mountain View, California. There are LEO historic materials held in several universities and archives including those at Manchester, Warwick, Melbourne University and the Charles Babbage Institute, USA. Oral histories of LEO pioneers and practitioners are available to listen to on websites such as that of The British Library. We support a doctoral student at Middlesex University and we promote public lectures on LEO. Details of how you can find out more about LEO can be found in our complete directory of sources - LEOPEDIA - available on this website, see below. The Society has long been determined to ensure that LEO material held by private individuals should be gathered together and made available for a wider audience. We are delighted to have recently formed a partnership with the Centre for Computing History, Cambridge. Together we applied for and were successful in gaining Heritage Lottery funding. Our project will collect LEO material, archive and digitise it where appropriate. We aim to establish a single window on to all the LEO collections wherever they are. We are also planning exciting new ways to tell the LEO story - for example, by creating a virtual reality (VR) version of LEO I. We invite all our members and indeed anyone interested in ensuring that the LEO heritage lives on, to get involved in this project. and anyone who has a specific interest in the history of LEO Computers. We encourage those who have an interest in LEO to join the Society- please see the Application Form. Membership is currently free of charge. THE LEO COMPUTER SOCIETY HAS ACHIEVED CHARITABLE STATUS. We are now a Charitable Incorporated Organisation (CIO) - registered number 1182253. Details can be seen here on the registration entry page. 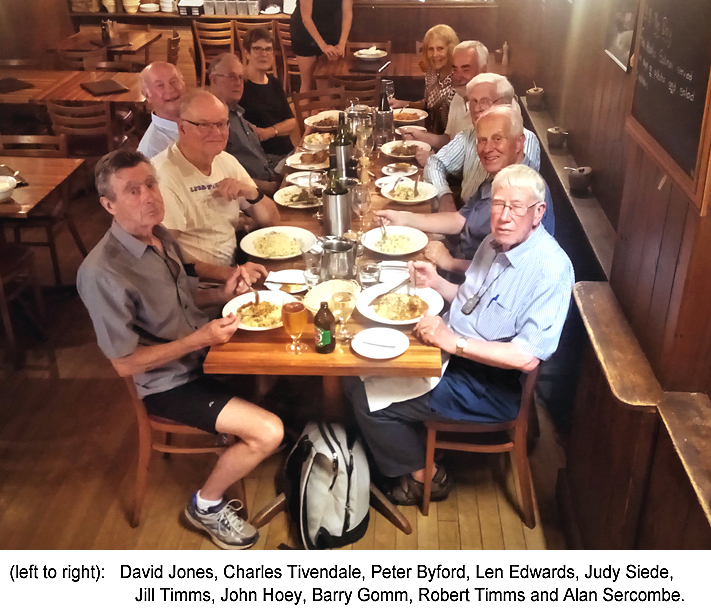 2019 REUNION A very successful 2019 Reunion was held at the Victory Services Club, London on Sunday 7 April 2019, (which was yesterday at the time of writing). More information and some photographs very soon. PDF version (30 pages) ..HERE.. Good news! The Leo Computers Society has won Heritage Lottery funding with our partners, the Centre for Computing History, Cambridge. The Press Release can be seen ..HERE and a message with more explanation from our Chairman, Peter Byford, can be read HERE..
90TH BIRTHDAY CELEBRATIONS ! ! An enjoyable gathering, with a buffet lunch, was held at The Queens Head pub, Brook Green (Hammersmith) on October 25th, to celebrate Frank and Ralph Land's 90th birthdays. LEO PLAQUE UPDATE An information board has been added to the LEO plaque, sited in Lyons Walk, (see News Item below, with a couple of added pics.) Or click .HERE. for a pdf of the Information details. This is the book of Leo reminiscences containing contributions from around 50 members and friends of our Society. Details of this, other Leo books and an order form can be seen HERE. A plaque to commemorate LEO, the World's First Business Computer, was unveiled by Dame Stephanie Shirley on 29th November 2016. Information and pictures HERE. LEO PhD SCHOLARSHIP AT MIDDLESEX UNIVERSITY. NIGELLA LAWSON AND LEO !